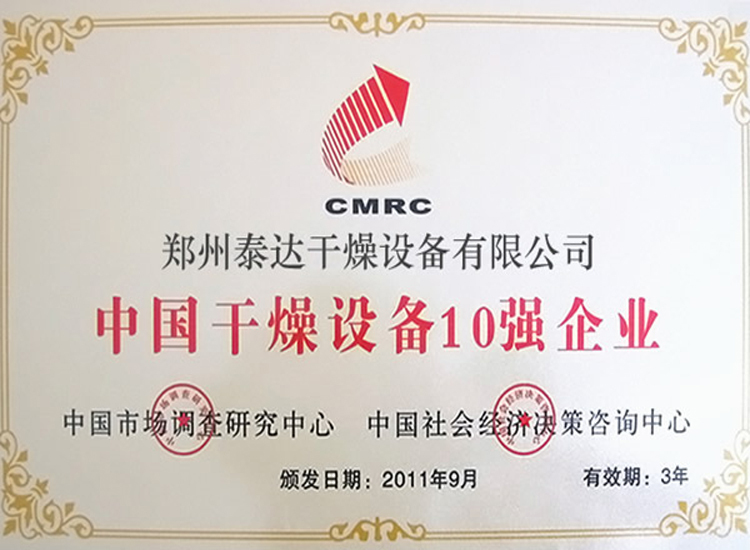 Applications: It can be applied to many fields such as pesticide, pigment, medicine, forage, food, paint, fertilizer and fine chemical industries. 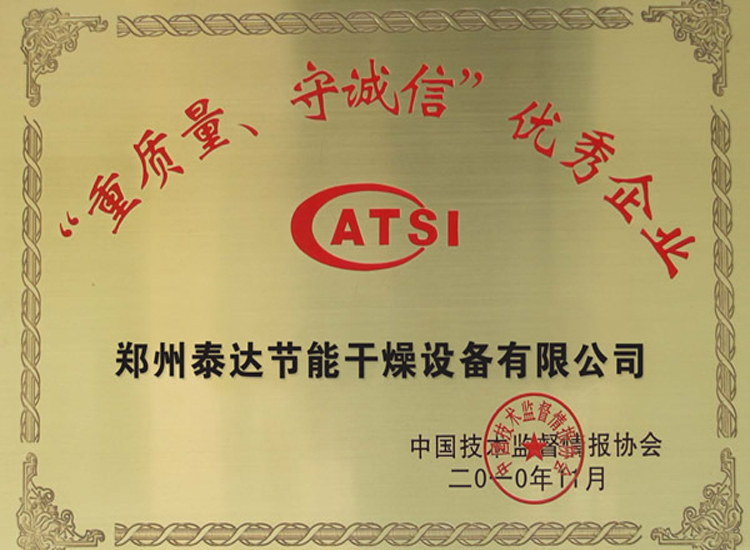 Based on years’ experience, our company develops a new generation of products. After development, design, demonstration and improvement, it holds many advantags such as advanced technology, fine structure, beautiful appreance and good performance. These advantages have reached to an international level. 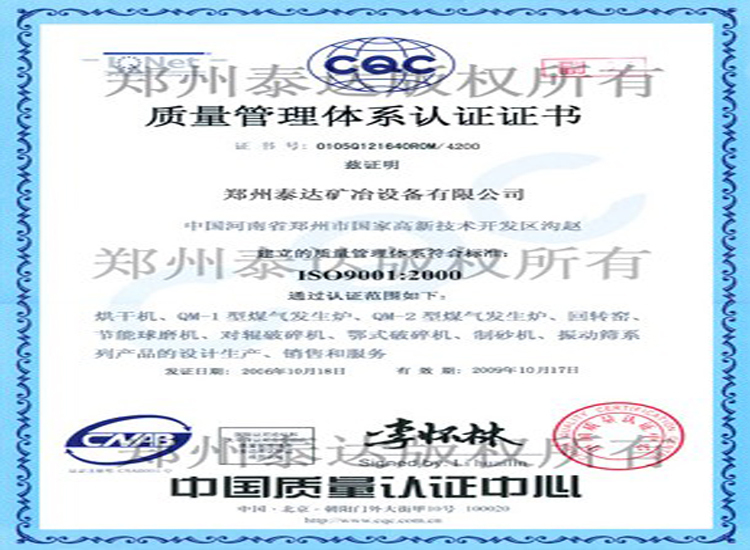 Thanks to its good performance, it has been widely applied to many fields such as pesticide, pigment, medicine, forage, food, paint, fertilizer and fine chemical industries. It can realize high efficiency, fast speed, energy-saving and no pollution. Relying on advanced management, strong technology, rich experience and perfect after-sale service, we can provide customers with efficient, fast and precise design by CAD according to materials’ quality and factory laryout. 1. Cone structure is installed at the bottom of drying chamber, which will makes sectional area of air grow larger from bottom to top. The air flow speed at bottom is higher while it at upper part is higher. 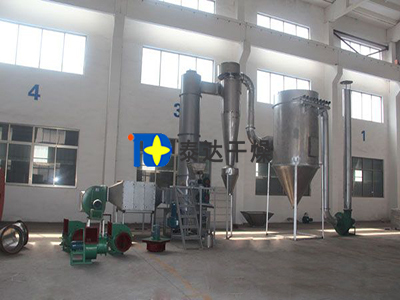 It can gurantee fluidized state of small and big granular-sized materials. Inner cone structure reduces the length of cantilever of mixing shaft, which will increase running reliability. In addition, this structure can avoid bad state of shaft while working in hot temerature area. Thus, the service span of shaft can be extended. 2. Scraper is installed on stirring gear. Materials are tossed the wall of machine while they are turned and crushed evenly by stirring gear. If materials stick on wall are not eliminated in time, serious scar phenomenon will arise, which will affect normal operation. The installation of scraper on stirring gear can peel materials off from machine wall before they stick firmly. 3. Grade ring is set on top of drying chamber. 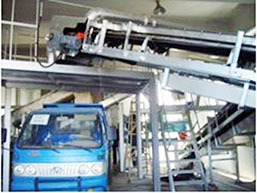 Its main function is to separate those large granular materials which haven’t been dried. Those large granular materials will be dried further in order to gurantee the uniformity of granularity and moisture. 4. Cooling jacket is set on the hot air port at the bottom of cone. The temperatuure of the place where materials start to contact with hot surface is very high. The temperature is almost the same with that of hot air, but much higher than that in bed layer. It is hard to avoid that part of materials stick near the ring gap. Owing to long staying time, materials will go bad, even melt. In order to avoid this phenomenon, jacket will be set on partial area, which will make the temperature here drop. Then, normal operation can be continued. 1. Strong drying capacity: owing to centrifugal, shear, collision and friction, materials are pellitized. These materials present high dispersion state. Relative speed between air and solids is fast, which strengthen the heat and mass transferring process. After being heated by heat exchanger, clean air will be blown into air inlet. Materials will enter the ring gap of drying chamber in a proper speed and enter drying chamber according to tangential direction. Then materials rise spirally. At the same time, materials are added into tower by a feeder which can regulate speed steplessly. In the drying tower, materials will exchange mass and heat fully with hot air. 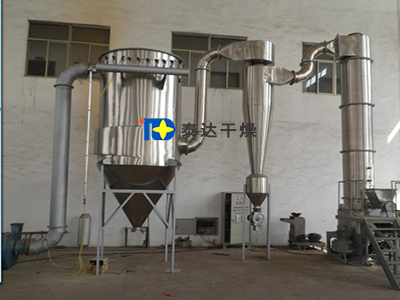 Dried powder materials will be sent to separator along with hot air. Finished products will be packed. After being disposed further by dust wiper system, tail gas will be evacuated. 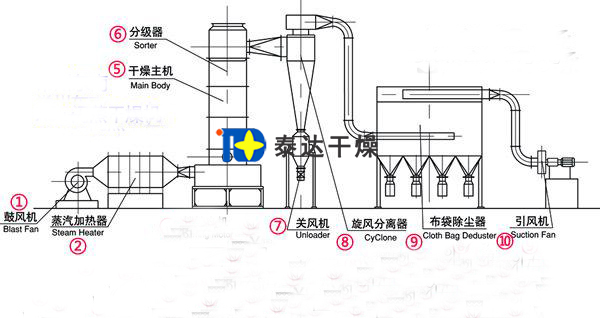 There is a spiral case air distributor and stirrer at the bottom of drying tower. By regulating the rotary speed of outer motor, the rotary speed of stirrer can be regulated steplessly. 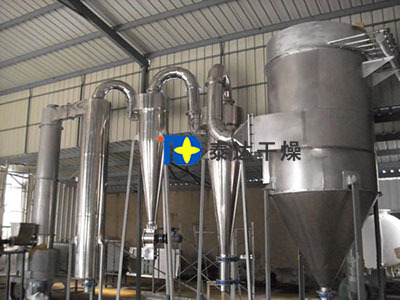 There are two functions of stirrer: it can drive hot air which enters drying chamber from distribution chamber and produces air flow which rotates fast. Thus, stable fluid layer can be formed. Unstable fluidization produced from partial local adhersion can be avoided. In addition, high-speed revolution of blades on stirrer smashes large-block materials. Granularities with moisture inner side and dryness outside will be constantly packed, peeled off and grated. The surface of materials is updated constantly, which increases the area for heat transferring and strengthens heat and mass transfer. Drying efficiency also gets improved. 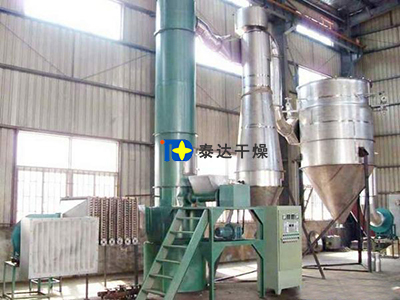 In addition, the gap between blades on stirrer and drying tower wall is very small. In order to avoid the going bad of materials caused by long staying time, clean materials on drying wall in time. In order to maintain the quality of materials, there is a cooling jacket set in drying tower wall. 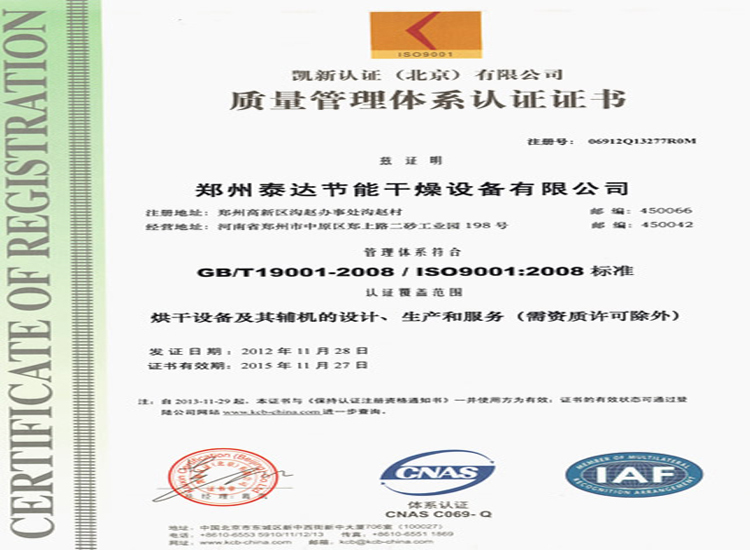 For thermal-sensitive materials, the quality can be granteed totally. Volute air distritutor makes air which enters dryer tangetially rise spirally through ring gap at bottom. Proper air from ring gap makes sure good fluidization and drying of materials. In the middle of drying tower, feeder which can regulate speed steplessly feed materials constantly. Meanwhile, after being smashed by stirrer at the bottom, materials will be blown up by hot air which rotates fast. There will be a relatively stable fluidization layer formed in drying chamber. Fast and full heat exchange is formed between materials and hot air. Most moisture is evaporated in this process. Because its gravity is greater than buoyance for materials which is smaller than surface and holds much moisture, materials will subside in drying chamber. Then, they are dried constantly in the process of subsiding. When materials move to bottom, they will be further crushed and dried after being crushing by blades and impacted by fast air flow. At this moment, gravity is smaller than buoyance. Material particles start to rise. On the top of drying chamber, a circular back plate, namely classifier, is set. Materials rise along with rotary air flow. Owing to centrifugal force, the radius of larger proportion materials which haven’t meet requests for moisture will be enlarged. 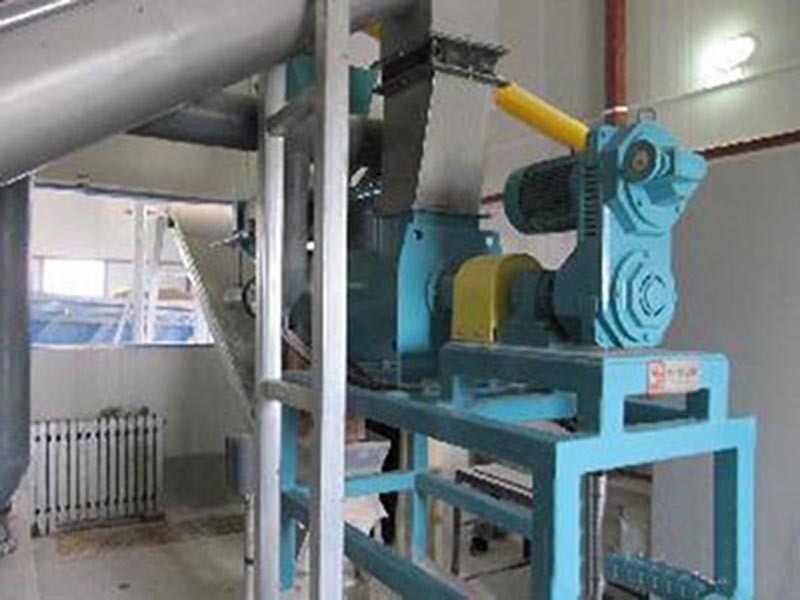 When the rotary radius of materials is longer than radius of classifier, materials will be blocked in drying chamber for further drying and crushing until meet relavant requirements. After bein dried in the middle of drying chamber, finer materials smashed will rise along with air flow. Owing to its small particles, small centrifugal force and small rotary radius, finer materials will be discharged along with air flow and sent to collecting device.